We’re headed back to Minneapolis! 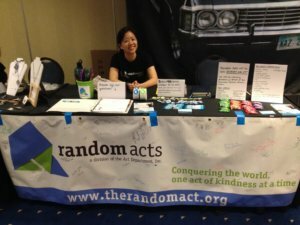 That’s right — from Aug. 12-14, Random Acts staffers Jennifer and Emma will be in attendance at Creation Entertainment’s Official Supernatural Convention (#SPNMinn), collecting supplies for a local nonprofit and hosting a number of kindness activities in which all are welcome to get involved. This time around, as in past years, we’ll be partnering with People Serving People, Minnesota’s largest and most comprehensive family homeless shelter. In addition to its various programs, People Serving People provides its youngest tenants with toys, books, and birthday parties, among other fun activities, to add to their quality of life. You can still get involved! From Friday through Sunday close, our staff will be hosting a number of kindness activities, including decorating notebooks for the children of People Serving People and writing uplifting notes and messages for the inhabitants. If you can pack notebooks, stickers, and decorating tools of your own and would like to make yours especially unique, feel free to bring those supplies along too! We’ll have plenty colorful adhesives, markers, and art supplies for you otherwise. … That’s okay too. 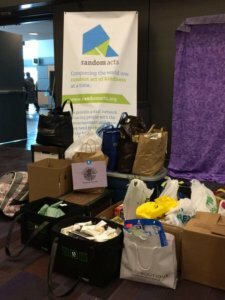 We know not everyone can make it to #SPNMinn and would never want anyone to miss out, so to keep all involved, even from afar, we’re challenging all our supporters to get out in their communities to do something kind for those in need. Whether you’re dropping off balloons and stuffed animals to kids at a children’s home or serving up meals at a local food pantry, every act — whether big or small — matters. Want to contribute to our notebook collection? There’s a place to do that too, even if you won’t be in attendance! Click here to submit your own kindness coloring book for our People Serving People “virtual” collection! Whether you’re headed to the Great North or staying at home with friends, we hope you’ll join us in making the world a better place, one random act of kindness at a time. Make sure to tag all of your social media posts with #SPNMinn and #GetKind so we can see what you get up to over the convention weekend! You can also follow along on Twitter (@RAFundraiser) to get regular updates on random drawings and giveaways!